The Great Smoky Mountains Railroad, based in Bryson City, North Carolina offers spectacular scenic views of the North Carolina mountains for which it is named. Since its creation in 1988, when it acquired Norfolk Southern's "Murphy Branch," the railroad has steadily grown into one of the country's most popular excursion attractions. None of this would have been possible without North Carolina's foresight in preserving a corridor which would have certainly been abandoned. The startup tourist train became an immediate success, surprising even its most ardent supporters. Today, the Great Smoky Mountains Railroad witnesses upwards of 200,000 riders annually and can attribute part of its success to the millions who visit the Great Smoky Mountains each year. Depending upon your interest the railroad offers a variety of excursions, from five hour trips covering the railroad's length (44 miles) to Thomas The Tank Engine special events for the kids. The information provided below is just a brief look at the tourist line, its history, operations, and what you can expect while there. The history of a railroad linking North Carolina's western mountains with its eastern coastal communities predates the Civil War. On February 15, 1855 the Western North-Carolina Railroad Company (WNCR) was incorporated through an act of the North Carolina state legislature. It was formed as a subsidiary of the state-owned North Carolina Railroad (This company, incorporated on January 27, 1849, remains owned by the state today.) in a far-reaching plan to connect Beaufort, near Cape Lookout, with Morganton, situated about 55 miles east of Asheville. The state hoped to significantly improve its transportation infrastructure, particularly in the western counties after a recent crop failure there had greatly hurt food stores. The Goldsboro-Beaufort section was finished relatively quickly (1858) although more funding was needed to complete the western component, in part due to the Civil War. Afterwards, in 1866, the state awarded $4 million to continue the project and it was soon opened as far as Morganton. The next section to Asheville was provided another $6.4 million but corrupt management under George W. Swepson and General Milton S. Littlefield precluded the railroad's completion. By 1869 rails had only reached Old Fort. With little progress, the state acquired the moribund and bankrupt Western North-Carolina Railroad in 1875 for $665,000 and renamed it as the Western North Carolina Railroad. Under the Tarheel State's direction, rails reached Azalea, just east of Asheville, in 1879. 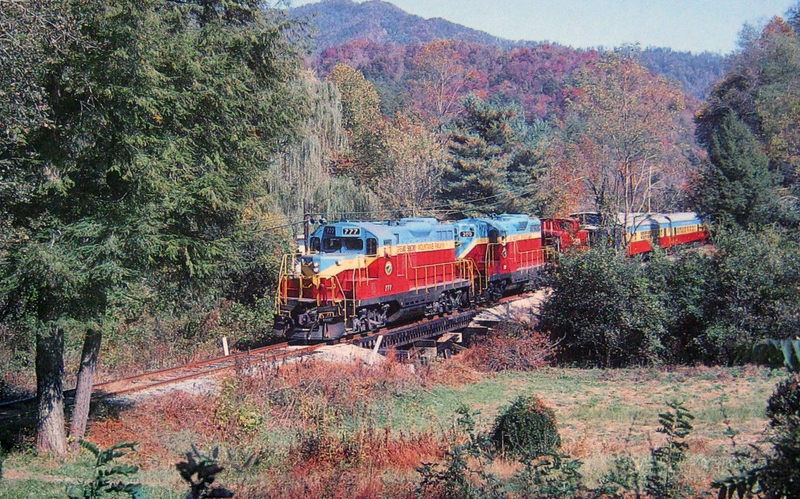 The article, "Revival For The Murphy Branch: How Great Smoky Mountains Railway Became A Big-Volume Tourist-Hauler," written by Jim Wrinn and featured in the February, 1993 issue of Trains Magazine, notes work resumed in 1880 to continue pushing the route further westward. The plan called for two main lines: one would extend towards Knoxville, Tennessee via Bulls Gap and another further to the east and south through the Nantahala Gorge in search of natural resources and a western connection. Engineers had difficulty surveying a manageable grade through this rugged region of the Appalachian Mountains. They first attempted to bore a tunnel through Balsam Mountain, 30 miles west of Asheville. However, this proved impossible so they wound up with a 2.7% grade to the east which then descended 3.8% before entering the Tuckaseegee River Valley. After reaching a community known as Charleston (now Bryson City) the route continued to the southwest with grades even worse through the Nantahala Gorge. Here, the only manageable alignment included a tortuous 4.2% grade climbing out of the narrow canyon. Finally, after passing through Red Marble Gap the line reached Murphy in 1891 where a connection was established with the Marietta & North Georgia Railroad (M&NG). One of this 122-mile segment's purposes was to haul consider timber, iron, and copper deposits from the region. Unfortunately, the narrow-gauge (3-foot) M&NG's arrival in Murphy during late 1886 (In 1897 the M&NG's Murphy Branch was converted to standard-gauge and the entire railroad was acquired by the Louisville & Nashville in 1902.) meant the Western North Carolina Railroad would be largely excluded from this traffic. Even prior to its completion, the state of North Carolina had lost interest in the endeavor. On April 30, 1886 it was leased to the much larger Richmond & Danville Railroad, which became part of the new Southern Railway system in 1894. * Built as #200. Sold. ** Built as #651. Became Burlington Northern #1551. Sold. *** Built as Santa Fe F7A #262-L. Rebuilt as Santa Fe CF7 #2501 at the Cleburne Shops (Texas) in September, 1974. Sold to National Railway Equipment in July, 1987 and became Texas & Northern Railway #992. Sold, 1990. **** Built as Santa Fe F7A #209-L. Rebuilt as Santa Fe CF7 #2530 at the Cleburne Shops (Texas) in March, 1974. Sold to National Railway Equipment in July, 1987 and became Texas & Northern Railway #993. Sold, 1990. During the Southern era the Murphy Branch served as a bucolic secondary line handling everything from local agriculture and livestock to timber (thanks to a number of local logging operations) and various less-than-carload business. In the steam era it was common to witness small 2-8-0's at work, which could both handle the required tonnage and negotiate the sharp curves. The branch contained a staggering 34 bridges totaling 4,800 feet in length. Interestingly, for all its ruggedness it featured only one tunnel, a 700-foot curved bore beneath Cowee Mountain situated west of Dillsboro. A major realignment of the branch was launched between Bryson City and Wesser in 1943 when the Tennessee Valley Authority began construction of Fontana Dam on January 1, 1942. As a result, 23.7 miles were situated on higher ground, which opened for service on June 30, 1944. As the years passed, the Murphy Branch saw increasingly less use with improved highways and freight customers switching from rail to trucks Passenger service ended in 1948 and important connections were lost during the 1980's; in 1983, the last component of short line Graham County Railroad, which interchanged at Topton, closed (With a heritage dating back to 1905 it once reached as far as Robbinsville, North Carolina.) while the Louisville & Nashville ceased service over its branch to Murphy in 1986. Nantahala Gorge Excursion: This excursion runs between March and late November with a final few trips held in late December. The train takes visitors on a 4.5-hour journey covering 44 miels from Bryson City to Nantahala Gorge with a brief, one-hour layover at the Nantahala Outdoor Center. By 1987 Norfolk Southern petitioned the line for abandonment, citing it had lost some 63% of its remaining carloads (handling just 817 that year) since 1978. With no buyers the railroad mothballed the route as of July 14, 1988 and it appeared the line's future was sealed. Then, the state of North Carolina stepped in and acquired the property for $650,000. A new operator was named, the Great Smoky Mountains Railway, Inc. which would rent the rails for $40,000 annually over 25 years. In addition, the state would receive a percentage of profits. What unfolded was a far more successful operation than anyone could have imagined. Thanks to its location within the heart of a popular tourist destination, the new railroad hosted fall foliage trips in October, 1988, months ahead of its officially scheduled opening in the spring of 1989 (freight service began on September 21, 1988 when a former Burlington Northern GP7 and Union Pacific GP9 were acquired). To meet this need the company hastily acquired two open-air cars; on October 15th the Great Smoky Mountains Railway debuted to the public with a total of four open-air cars and a former Norfolk & Western caboose. Its first twelve runs that fall sold 6,238 tickets and by 1993 ridership had soared to 160,000. One reason for the railroad's rapid interest was the addition of 2-8-0 #1702 in late 1991. This Consolidation was a 1943 product of the Baldwin Locomotive Works and had previously seen excursion service on Nebraska's Fremont & Elkhorn Valley. It was originally built for the U.S. Army where it worked in Europe during World War II and was later acquired by a famous Arkansas short line the Reader Railroad. It was pulled from service in 2002 requiring the standard Federal Railroad Administration's 1,472-day boiler inspection. Its restoration finally began in 2014 and the locomotive returned to service in July, 2016. 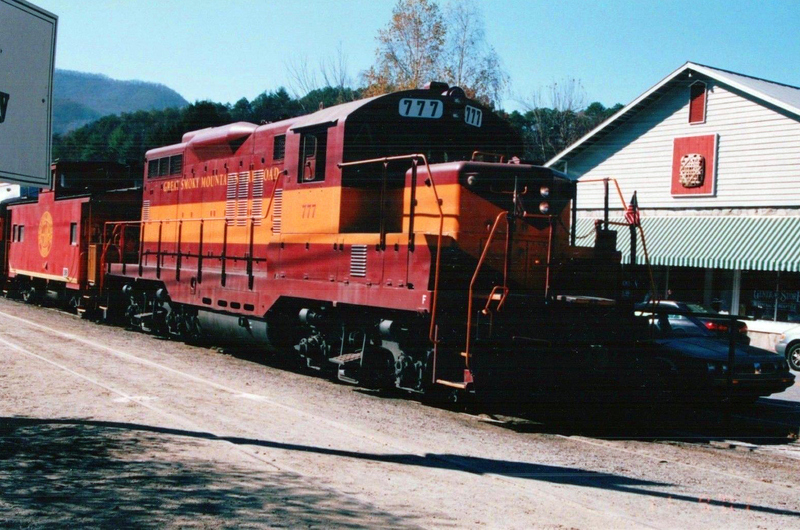 In 1999 the GSMR saw perhaps its biggest change to date when it was acquired by American Heritage Railways and subsequently renamed as the Great Smoky Mountains Railroad. 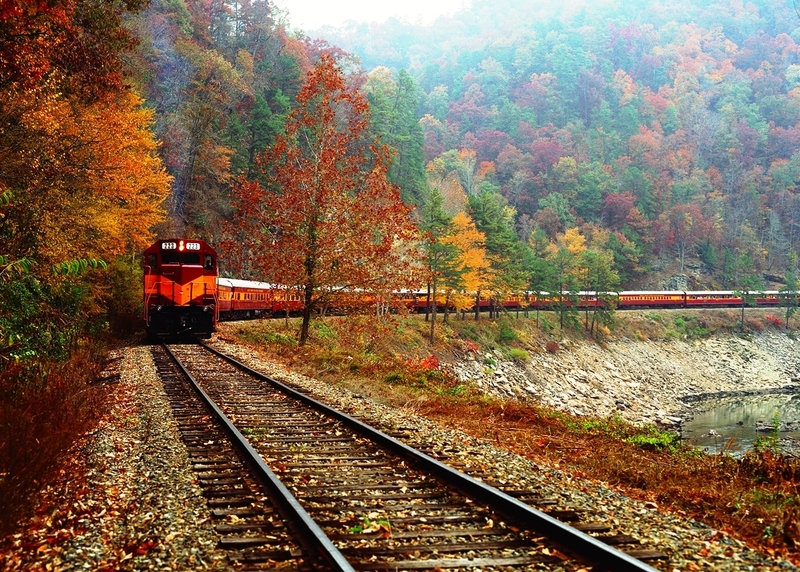 While its standard excursions take you through the Nantahala Gorge it also hosts several specials including "A Day Out With Thomas," "The Little Engine That Could," the "Pumpkin Patch," the "Easter Beagle," and the "Polar Express". Additionally, fares for these trains (and all excursions the railroad offers) depend on what type of seating you would like. For more information about these trains and riding the Great Smoky Mountains Railroad please click here to visit their website.